What happens when you take two busy boys, a planned long-haul international flight, and a love of Lego? You get Fun N’Fly! Well, at least the very first prototype. Back in December of 2015, Mommy Brain Creatives Inc. Founder Anita Fu, a seasoned air traveler, was preparing to travel to Asia solo with her two young children in tow. The boys – aged three and five – loved Lego with a passion and wanted to bring some along on their trip. One week before leaving, Anita realized that she needed something to keep all the Lego pieces contained while en route. 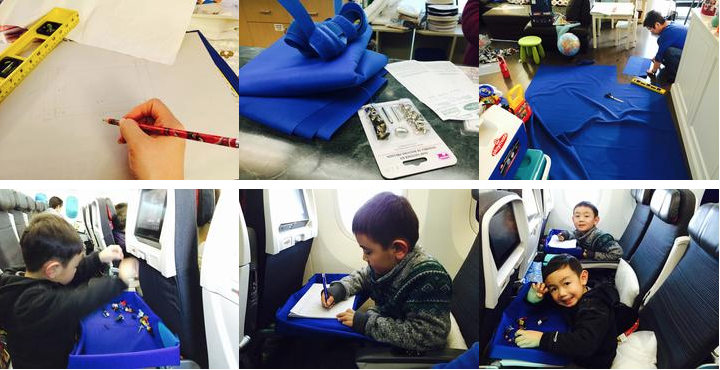 The natural problem solver in her kicked into high gear and after a trip to the dollar store, the fabric store, and armed with a few materials from home, Anita, with the help of her mother-in-law, put together her very first Fun N’Fly travel tray. Although a bit rough around the edges, the original prototype served its purpose, and mostly importantly kept her boys happy and entertained (and the Lego off the floor!). After returning, and sharing the tray with a few friends for their own flights, Anita realized that there was a need on the market for her product. In early 2016, she reached out to a friend in Hong Kong who also ran a well known toy company of her own, to help make her dream come true. After working through a number of different prototypes and fine tuning the product’s development, the finished Fun N’ Fly Foldable Travel Tray was ready for introduction to the market in the fall of 2016. It is now available online and in select retail stores. The sky is the limit for Anita who hopes to introduce more products in the future that help make every mom’s life easier, whether at home or at 30,000 feet. Stay tuned!